Scrooge has the darkest heart in London; a miser with a love for nothing except money. He is feared and despised until one Christmas Eve. Scrooge receives three spectral visitors, encounters the bleakest terror and the richest delight. He learns, at last, the true meaning of Christmas. A tale of redemption, with a mix of laughter, thrills and chills along the way. “I had not seen this adaption by John Mortimer before and was not aware if the various speakers replacing a narrator were his idea or that of the director Patricia Melluish. I also wondered if there had been sufficient rehearsal time or perhaps difficulty with a large cast’s regular attendance, but on the night I saw it there seemed to be a slightly shaky start. This soon settled however and I did enjoy this ‘in the round’ performance. This sort of choral speaking with voices coming from differing parts of the auditorium is not easy and a prompt response and clear enunciation is necessary to overcome any defect in the acoustics. Dicken’s tale of redemption is well known and it is difficult for a critic not to make comparisons with other performances he has witnessed. The central character of Ebenezer Scrooge, what a glorious name, was played here by John Heather. He kept the play together remarkably well, though perhaps his mean period might have benefitted by more underplaying. On the other hand his redemptive period was magnificent and I cannot commend it highly enough. Geoff Dillon had the difficult part of Bob Cratchit, but he persuaded me that he was a kindly, decent, honourable employee, and family man; indeed the whole family came alive and at Mrs Cratchit’s (Sue Hicks) righteous indignation against the toast ‘to the founder of the feast’, I felt like cheering. The whole family was real including a very small Tiny Tim (Zuzette Paulson). There were many good moments and one of these was the breaking of the engagement between the young Scrooge (Chris Sharriock) and Belle (Charlotte Storey). Also the scene where the sale of Scrooge’s belongings in Old Joe’s (Dennis Packham) Pawn Shop took place with Mrs Dilber (Sandie Campbell) and the Charwoman (Jean Golder). 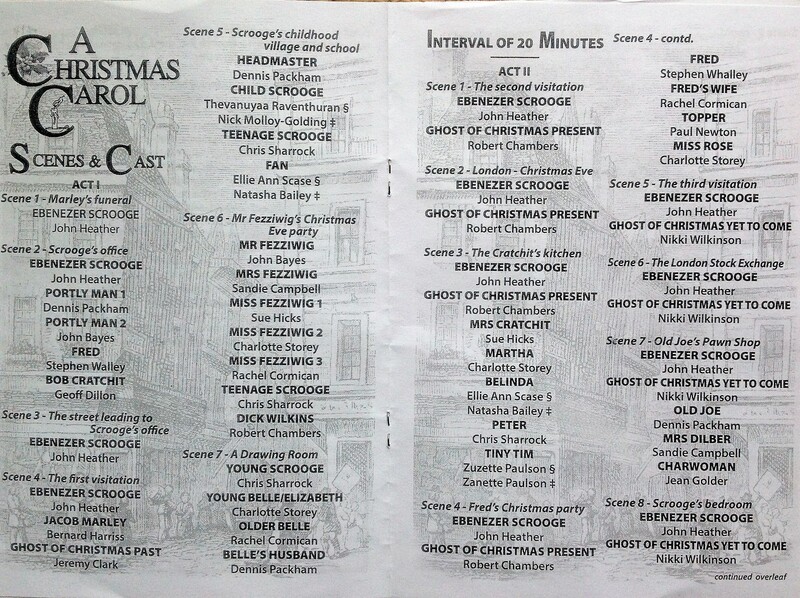 John Bayes as Mr Fezziwigg gave light to the spirit of Christmas and the Ghosts of Christmas Past, Present, and Yet to come played by Jeremy Clark, Robert Chambers, and Nikki Wilkinson, respectively were all excellent. The first spoke naturally, the second as if in an echoing chamber and the last spoke not at all, but had the advantage of being very tall and frightening. Fred as Scrooge’s good natured nephew was played by Stephen Whalley, his wife by Rachel Cormican, Topper the bachelor by Paul Newton and Miss Rose by Charlotte Storey. And in the Blind Man’s Bluff scene they managed to make it look spontaneous. The vertical bed of Scrooge was brilliant and enabled us to see his reactions as if we were above it with a bird’s eye view, but the door panel sliding back to reveal the face of Jacob Marley (Bernard Harris) was perhaps a little too clearly lit though still effective. He did very well however, with the sepulchral voice and the chains he forged in life. “I always say to students, ‘It’s easier to critique a play that is badly done than one that is well done’ So this production of A Christmas Carol has left me with a really difficult task. Even more so, as I had no idea that I was going to be asked to say a few words about the production until I was about to take my seat. Let me then say from the outset, that I thoroughly enjoyed the performance from the opening moment when the carol singers came on stage to Tiny Tim’s closing line, ‘God Bless everyone’ . The ensemble work was extremely well done and that it owed its success to the director there can be no doubt. The cast were comfortable performing in Theatre in The Round and moved easily around the stage changing the shape of the visual image as smoothly as a child working a kaleidoscope. [Well that’s dating me]. Too often actors in Theatre in The Round become rooted to the spot and forget that they need to present themselves to the audience in differing aspects. Not so you guys. Even the curtain call was well choreographed to ensure that every member of the audience was catered for. The director’s vision of staging this production In the Round was a masterpiece of direction. By breaking the fourth wall, the audience was drawn into the play from the outset and on many occasions felt so comfortably a part of the performance that they clapped along with the actors at the dance and strained at the leash to join in with the Carol singing. Likewise, the audience felt they were an integral part of the street scenes as well as the more intimate Scrooge’s nephew’s family Christmas games and the Cratchet’s Christmas Dinner. In addition, we felt that we too were on the same journey as Scrooge as he wandered the ether with the ghosts of Christmas past, present and future, and in so doing we may also have questioned our own charitable approach to the Christmas Season with so many homeless people in Britain and particularly in the Capital. Narration in a play is always difficult to pull off without it seeming to be an ‘add on’ extraneous to the production. However, the narrative technique of the ensemble ‘in the wings’ as it were, scattered around the auditorium created a stereo or quadraphonic effect. In addition, the concept of the actors narrating in the third person as they appeared on stage before slipping easily into dialogue was thoroughly effective and successful. It is difficult to fault any of the technical support that both enhanced and augmented the performances in the most skilful and subtle of ways. Particularly effective was the use of the echo to differentiate between the naturalism of Scrooge’s voice and the supernatural utterings of Marley and the three ghosts, well, two of them, anyway. In addition sound effects used to enhance scenes were used most effectively. Too often sound engineers get carried away with a good sound effect, often drowning out the poor actor. Not so in this production. Extra voices chattering in the background in the street scenes were subtle and non pervasive, allowing the audience both to hear the dialogue while further adding to the feeling that they too were part of the scene. In contrast, the more pointed and highlighted effects such as the opening and closing of the shutters were timely and effectually executed. The dramatic entrance of Marley’s Ghost and, indeed the appearances of the three other Ghosts introduced and maintained elements of suspense throughout the show.. The combination of music, sound effects and the effective and appropriate dramatic lighting cues, further emphasised the work of the technical crew. Indeed, the lighting design was commendable. The gobo of Marley’s coffin and the dappled effects used later on in the production were extremely effective as was the highlighting of Scrooge with the three ghosts and especially with the ghost of Christmas Past. Who could not applaud the candle lights of the headwear of this spectre? And I am sure that I shall be haunted by the piercing red eyes of the ghost of Christmas to Come for many a moon. Kudos to Jon Lewis and Ian James for their combined team work. The set design was just a joy. I really thrilled to the minimalist sets from the simple Cratchit dinner table with some realistic props of goose and a saucepan of mashed potatoes and a steamed Christmas pudding to the mimed glasses for the Christmas toast through to the street cart and scrooges’ bed. Incidentally, I wondered how many of the audience were aware that this design was first introduced in the West End production of The Canterbury Tales in the early 70’s and has been emulated by set designers since. What a tribute. So effective, too were the simple high desks of Scrooge and Cratchit and the period school desk. But what really made the minimalist use of furniture was the effortless and unobtrusive way that the cast brought on and took off the furnishings and / or props. Bringing on the sacks and gathering them up later, for example by Chris Sharrock was unobtrusively slick as was the introduction and removal of the chaise longue. Finally, who could forget the dramatic and unexpected trap door in Scrooges front door, revealing our first glimpse of Marley’s ghost? Nor can one forget the Brechtian epic theatre use of puppets skilfully representing The Ghost of Christmas Present and Scrooge flying through the air as well as the rather disturbing puppets of the children concealed beneath the robe of Christmas Present. Again Kudos to all the technical staff, from Andrew Heather and John Heather [is there no end to this man’s versatility?] and Alan Matthews as well as to Frances Denne, Properties and James Quinn and Chloe Belgrave Technical Operators not to overlook Jackie Dowse for the enchanting, yet at times, somewhat disturbing puppets. One of the most important contributions to the production was the excellent, period costumes, courtesy of Margaret Uzzell, Joan Martin, Val Polydorou, and Diana Quinn. With so many contemporary costumes and costume changes one can only congratulate the Costume Department and Dressers. Especially well done were the costumes of Marley and his shackles and the three ghosts, each superbly individual [ though as I have said I especially liked the candlelit head gear of The Ghost of Christmas past, the Exotic wreath of The Ghost of Christmas Present and the eyes of The Ghost of Christmas to Come] while all the cast wore authentic period costumes appropriate to their class and status. Mention, too, must be made of the make-up worn by Marley’s Ghost, Ghost of Christmas Past and the bony finger of the Ghost of Christmas to come. Alice London, Christine Lever, Jean Golder and Penny Vetterlein deserve a mention in despatches for their important contribution to the performance. It is hard to single out any performances when the ensemble work was generally of a high standard. However, one has to pay tribute to the taxing role of Scrooge, played so confidently and sympathetically by John Heather. His journey from the early no-nonsense Scrooge morphing into the magnanimous child-like character was well executed. Other roles that deserve mention are those of Bob Cratchit played sensitively by Geoff Dillon. The two portly men, Dennis Packman and John Bayes whose double act in their early and later scene with Scrooge provided a contrast by which to measure early Scrooge and transformed Scrooge. Indeed, these two actors contributed to the ensemble work throughout, as well as playing other characters such as Old Joe and The Headmaster [Dennis Packman] and Mr Fezziwig [ John Bayes]. Bernard Harriss chillingly introduced us to the supernatural, as Marley’s ghost, which mantle was taken up by Jeremy Clark as The ghost of Christmas Past and further augmented by Nikki Wilkinson as The Ghost of Christmas to Come. Robert Chambers, as The Ghost of Christmas Present was a good, strong contrasting no-nonsense foil to the afore-mentioned spirits. All four actors used the stage well and appeared to be comfortable doing so. One was aware of a strong sense of support from the ensemble that played their roles truthfully in the crowd scenes and as members of various families. 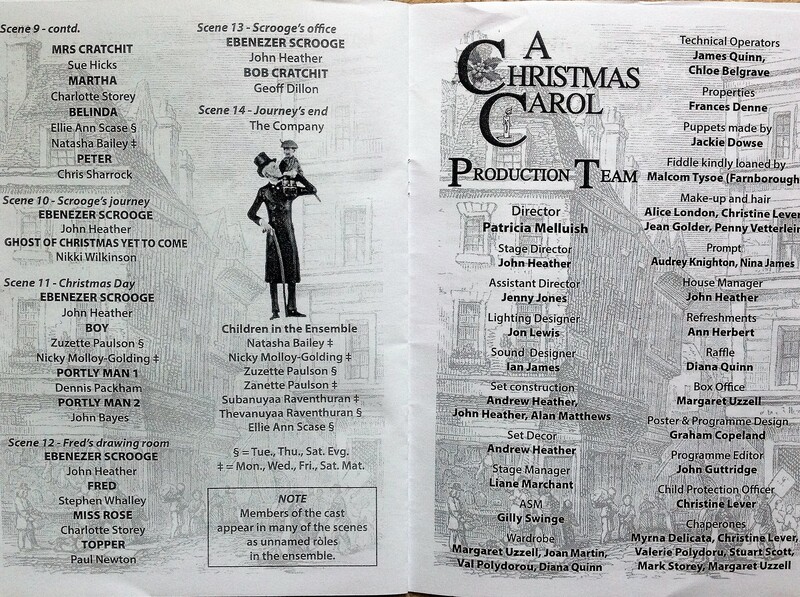 For example Stephen Walley as Fred, Paul Newton as Topper, and Sue Hicks as Mrs Cratchit deserve mention for their strong contributions. . Noel Coward once remarked, ‘There are no small parts, there are only small actors’. Not so here. These actors rose to the occasion making every part meaningful and believable. There were also some nice cameo roles, with Sandie Campbell playing the cackling toothless hag Mrs Dilber and Jean Golder as the Charwoman bringing a sense of black humour to the production. It was pleasing to see that the high standard of acting was maintained by the younger generation of actors. Rachel Cormican played many different roles with conviction especially as Miss Fezziwig and Fed’s wife, for example. Chris Sharrock was confident in the roles of Teenage Scrooge, The Young Scrooge and Peter and displayed a strong stage presence, showing great potential, while Charlotte Storey displayed immense skills and sincerity in all of her roles as Miss Fezziwig 2, Young Belle/ Elizabeth and Martha, displaying a veracity in her performances that can come only from a careful study of Stanislavski and his system. The youngest members of the cast brought a freshness and innocent enthusiasm to their roles. Thevanuyaa Raventhuran, Ellie Ann Scase and Zuzette Poulson (also Natasha Bailey, Nicky Molloy-Golding, Zanette Poulson, Subanuyaa Raventhuran) just broadened the brush strokes on what was already a well depicted canvass. Particularly refreshing were the knock down ginger scene at Scrooge’s front door, the boy being sent off to fetch the poulterer and Tiny Tim’s sustained and believable disability as well as his moving rendition of the carol at the Cratchit’s Christmas Dinner. If I may borrow from a modern teaching technique, I have so far dwelt on the What Went Well aspect of the production, but with your indulgence, I should like to just add a few thoughts of what could be better If……. While the pace was good for majority of the production, with all actors picking up cues well, there were a few rare occasions where it flagged a bit. Fortunately, due to the episodic nature of the play these moments were soon rectified by the energy and enthusiasm of the ensemble work. Sometimes, too, I felt [ though I have to say I was overruled by my companions here] that some of the younger cast members, while executing their roles well, were, on occasion, inclined to television performances and I should have preferred them to be a little more demonstrative in their delivery considering this was a live stage performance. It can be too easy to think that in acting in the round one does not need to project one’s voice. Obviously one would not project as strongly as acting on a proscenium Arch stage, but one does need to project just a little bit more than on a film or television set with sensitive camera mikes or a boom mike being employed. As I said this is only my opinion not endorsed by the other members of the party who came with me. The only scene that I would question as not working well was the near impossible scene where Scrooge changes out of his night attire into his day clothes. There was a hiatus here which I felt could, perhaps, have been covered by a lively street scene or some more carol singing? To conclude, I always think that the acid test of a successful performance is audience reaction. I happened to be seated directly opposite a youngster whom I noticed sat wide-eyed and riveted to the action throughout. There can be no greater affirmation of a successful show than that.